Ahh.. the pickup truck, one the most underrated pieces of machinery on the road today. Many drivers get anxious about their size, their weight, and their footprint, leaving no time to appreciate the architecture and intricate engineering behind them. Drive next to one in your petite hatchback and the only thought going through your mind would be " Don't you dare hit me!" But for those of us that drive these small-shadow vehicles, we've come to accept the fact that we have to share our streets with these lane hogging behemoths, even if we harbour an avoid-at-all-cost attitude. 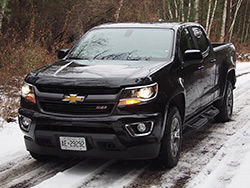 But did you know that nearly 340,000 pickup trucks were sold in Canada alone in 2014, and 126,000 of those were Ford F-150s? That's more than a third of all Canadian trucks. One F-150 is sold every four and a half minutes! Open your eyes, sweep those trucks from your periphery into focus and you'll see it's true. Trucks literally litter the streets. 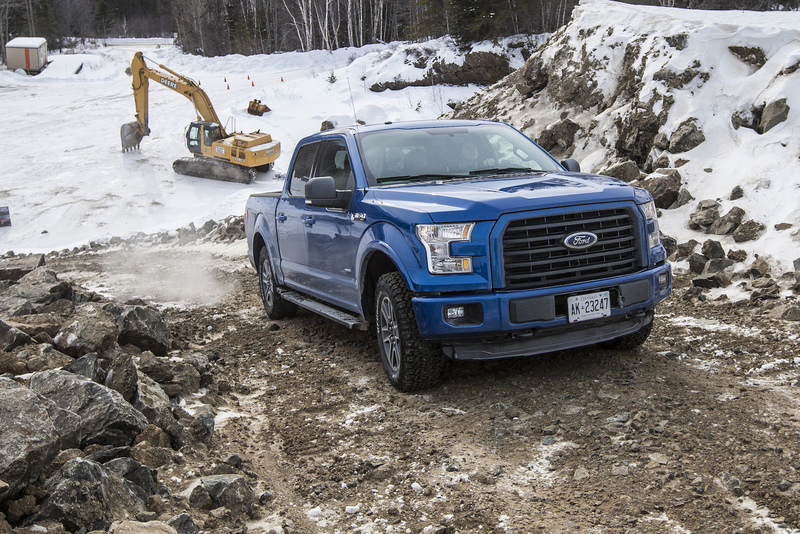 Ford Canada told us that their new 2015 F-150s barely last a few days on the dealer lots. It is without a doubt their cash cow and conveniently, their golden ticket to the bank. So what makes the F-150 Canada's best selling pickup truck for 49 years running? Well they ought to be doing something right. Here's an interesting fact for you, most pickup trucks spend 80% of their time with an empty bed. So they're lugging around extra weight and revving out a beefy engine to move its colossal weight, just for that lucky day (for the most part) that they'll need to haul or tow something heavy. Ford's solution? Aluminum (or aluminium for those Brits reading this). The 2015 F-150's new aluminum body sheds off 317kg (700lb) of weight, a figure that is subject to change depending on the engine, cab, and bed configuration. Yet, it's still being labelled as a game changer in the world of trucks. So Ford Canada gave us the opportunity to take a fleet of their golden geese onto our favourite scenic roads along the St. Lawrence River. City roads, highways, and a custom built off-road and handling track were all present to test out their abilities. After a solid two days with the F-150, here are our first impressions. The outgoing model was known for having so many trims and options it was like trying to comprehend an incestuous family tree. For 2015 however, Ford has narrowed down the number of trims available, making it easier to understand the F-150 lineup. There are four engines to choose from, including a new and most curious 2.7-litre twin-turbo direct injection Ecoboost V6. Cool Fact #1: It's actually Ford's smallest engine ever to make it into their F-Series. Cool Fact #2: It's the only engine in the lineup that comes with START/STOP technology. Cool Fact #3: It's made with compacted graphite iron, the same dense material they use on Ford's mammoth Super Duty diesel engines. It's heavier than aluminum but it allows for thinner castings and a more compact design. Cool Fact #4: Spewing out 325 horsepower and 375 lb-ft of torque, it has a larger torque-to-weight ratio than the 5.3-litre V8 Silverado, the 3.0-litre diesel RAM, and the 5.7-litre V8 RAM. While truck enthusiasts might squeal at the sound of turbocharging, there's a great deal of boost in the low RPMs and they're quick to spool as far as turbos go. If you can bear with the lag, the resulting surge of torque will be worth your patience. Ford's standard 3.5-litre V6 and 5.0-litre V8 make a welcome return to the stable, along with the 3.5-litre twin-turbo Ecoboost V6 to top off the spectrum with 365 horsepower and a mighty 420 lb-ft of torque. Nothing beats the linearity and visceral buildup of that naturally aspirated V8, but the 3.5-litre Ecoboost still has that gritty low-RPM push. In fact, the latter gets 90% of its peak torque from as low as 1,700 RPM. Let the engine debates begin. Truck loyalists won't be able to resist the V8, pragmatic truck users will flock to the 3.5-litre V6, leaving the 2.7-litre V6 in the sweet spot of compromise between power and fuel-efficiency. The rest of the F-150 powertrain gets carried over from the 2014 model: An updated all-wheel drive system, a live axle rear suspension, and a six-speed automatic transmission, one that feels tuned for fuel-efficiency rather than for performance. We noticed quicker responses and gear changes when we left in it manual mode and rowed the gears ourselves. Electric power steering conducts a bold entrance, but unfortunately it makes the steering way too light. It's a disappointing element that isn't exactly conducive to building up confidence behind the wheel. 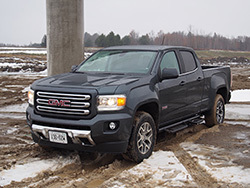 It was easy to drive and maneuver this massive truck, but it zapped out any steering feel or feedback that I'd desire when rock crawling or climbing a steep hill. On the positive side, it did a great job in masking a lot of the steering vibrations that would otherwise hinder a comfortable driving experience. We spent most of our time in the 5.0-litre V8 powered F-150 dressed in the King Ranch Platinum trim. Loaded with every option in the book, our F-150 gained back quite a bit of that lost weight. So it wasn't a surprise when we averaged 19.1 L/100km with a mix of city and highway driving. Yet, I am curious to see what kind of long-term mileage the new 2.7-litre Ecoboost V6 would achieve but being limited with time behind the wheel, we didn't get that chance. 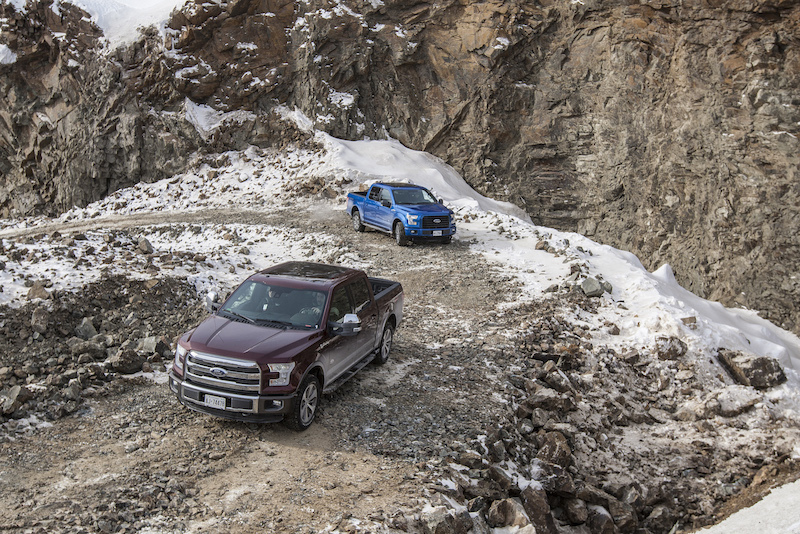 Ford generously set up three exercises to utilize their new F-150's capabilities. The first was an off-road course littered with rocky uphill trails, icy steep downhills and uneven terrain. 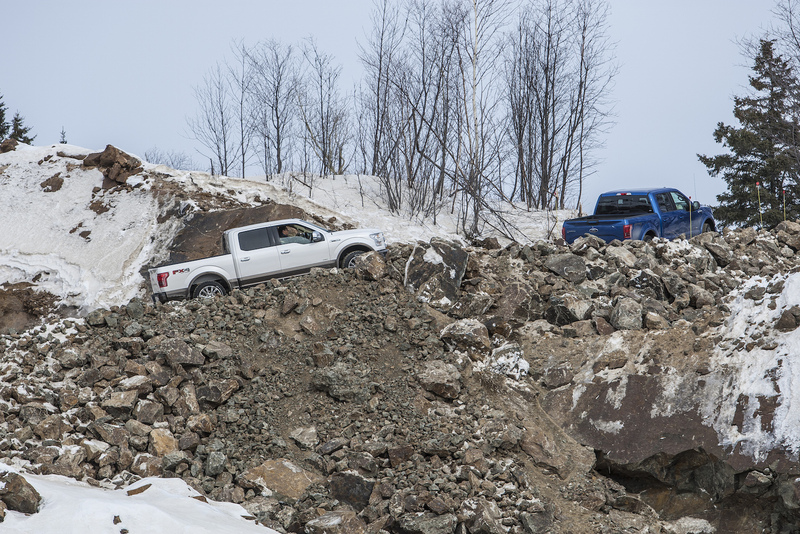 Leaving the F-150 in AUTO mode, it's four-wheel drive system breezed effortlessly up the hills, not showing any cracks in confidence or finesse. The Hill Descent Control also worked brilliantly. Essentially you let go of the brake when going downhill, and the computers will take over and inch you to safety at the optimal speed. The next test was a handling course. 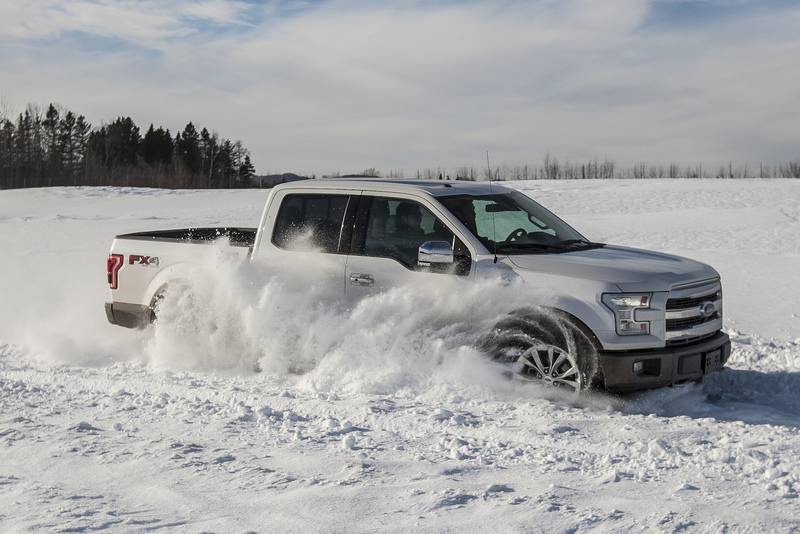 It was around the slalom that the F-150 felt instantly lighter than its predecessor. With hundreds of pounds shed off, it turned quicker, stopped quicker, and accelerated quicker. We also had the chance to tow a trailer hitched up with two snowmobiles. The ride got mildly bumpier, but the F-150's soft suspension delivered outstanding highway comfort even with the extra baggage. 2015 changes aren't exclusive to the F-150's mechanics, but also to its looks. Notice the new front grille, one that looks like a Gilette razor on the Platinum trim. It keeps a square face but with distinctive puzzle piece headlamps. Those bright LEDs also make their way under the side mirrors and into the bed as well, meaning working at night has never been easier. There is also a nifty box side-step for smoother bed loading and a remote opening tailgate activated via the FOB key. Watch for falling aluminum, little ones. Swinging the driver's door open helped me notice the slenderness of the new aluminum body. The door was so light that you have to treat it like a tennis forehand to shut it properly. It actually reminded me of those featherweight Jeep Wrangler doors. The King Ranch interior was definitely my favourite out of all the trims, and has got to be the most sumptuous and classiest cabins of the bunch. Decorated with black leather and orange stitching to match the otherwise unconvincing wood panels, I prefer this design over the conventional all-black layouts. Large windows and a lovely dual-panel sunroof flooded the cabin with light to create a very open concept. The sun also acted as a disco ball for the party of hard buttons on the center stack, thank goodness for hard buttons. The steering wheel also got an update; it's beefier, more solid, and came with buttons cut out of a game of Operation. Other creature comforts included were massaged, heated, and cooled front seats - the luxury sedan of pickup trucks. The rear section of the SuperCrew trucks weren't a bad place to be in. There's no more transmission bump so the rear floor is actually flat. More legroom! The ride was soft, the seats felt like La-Z-Boys, and the cabin was incredibly quiet and refined, perfect for cruising along those sunny streets of Quebec. Utilizing aluminum was just the start for the F-150 and the smaller, more fuel-centric 2.7-litre Ecoboost engine was a handy addition to the lineup. Needless to say, all these weight savings and attention to detail should be applauded, but the diet results aren't as substantial once all the luxury options, leather, and safety equipment have been tacked on as you ride up the trim ladder. But the F-150 is still an incredible package. With so many engines, cab configurations and bed dimensions to choose from, there seems to be an F-150 for everybody. There is a part of me though, that still desires a diesel engine and a lightly optioned base F-150 XL that we could test. Regardless, it's just the beginning for the anorexic F-150. 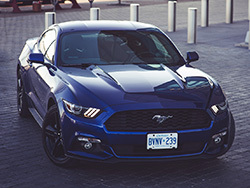 It's a new chapter for Ford pickups, one that has started with a bang, as the 2015 F-150 was named AJAC's (Automobile Journalists Association of Canada) 2015 Truck of the Year and 2015 Utility Vehicle of the Year, beating the likes of the Porsche Macan S, Subaru Outback, Chevrolet Colorado and RAM 1500. Ford has made many risky moves to get here, ones that seem to be paying off in spades.